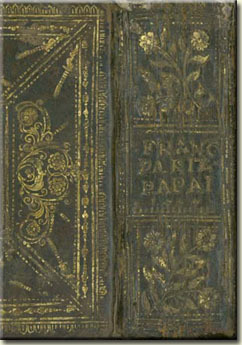 One of the gems of the Library of the Hungarian Academy of Sciences is the Album Amicorum of Ferenc Pápai Páriz, Jr., which he carried with himself on his one and half decades of European peregrination (1711 – 1726). This album amicorum, the use of which followed a widespread European practice of the age, is now made available for all the researchers of the period, and all the curious who want to see this relic of the past with their own eyes. Its content opens a special window on the intellectual life of eighteenth-century Europe. The 122 pages of the Album preserve autograph mementos written in Arabic, English, French, German, Greek, Hebrew, Italian, Latin, Spanish or Syriac – and in many cases in more than one language – signed by English, Danish, Dutch, French, German, Hungarian, Polish and Swiss personalities: bishops, professors and physicians, as well as several students who became celebrities of the next generation. The mementos are regularly composed of a quotation, a motto and a recommendation, followed by a signature. Our digital edition was structured in such a way as to offer the consultation of these notes by names, places or dates, or by browsing through the original album page by page. The presentation of the material is complemented by the biographies of the persons who made their notes in the album, with frontispieces of the important works, maps and portraits, in order to offer the best information available to the readers. These pages revivify the diversity and complexity of Europe, and perhaps also the dream of a unity based at the same time on the acknowledgement of differences, and the existence of common roots, as conceived already by the first humanists. The physician Ferenc Pápai Páriz, Jr. was born in Transylvania (Nagyenyed / Ajud) on May 1, 1687. His father, Ferenc Sen. was court physician of the Prince of Translyvania, and acquired international reputation in his profession. Apart of various medical treatises, he was the author of the most popular Latin-Hungarian dictionary. Ferenc at the age of ten was sent to Nagyszeben (Sibiu) to learn German, and then studied in the College of his native town Nagyenyed, which had a high reputation as the Eastern European center of studies for Protestants. In 1711, according to the custom of the period, he set out on a peregrination of fifteen years to various academies of Protestant Europe, studying medicine, philosophy and theology. This journey was carefully planned and prepared by his father, who had good contacts and friendly relations with several eminent intellectuals of the period. All of them offered warm welcome to his heir. Ferenc graduated in medicine in Halle in 1714. He continued his studies in Leiden, where he also accomplished works for other students of Nagyenyed. After a period of matriculation in Franker, from 1718 until 1726 he studied in England. This period was only broken by a short trip to Switzerland and the Netherlands in 1719. In 1726 he returned to Transylvania. Apart from studies, a secret mission of Ferenc Páriz Pápai was to collect funds from Protestant princes and institutions for the reconstruction of the College of Nagyenyed, which had been destroyed twice – in 1704 and 1707 – by Austrian troops. In fact, he collected about 7,000 pounds in ten years, a part of which, deposited in English banks, served as late as 1850 to support the students of the College of Nagyenyed in their studies abroad.